By Sean Charlesworth on Dec. 30, 2014 at 12:02 p.m.
Sean's favorite gear of the year! To start, let’s talk about some of my favorite 3D printing tools and accessories that I use at home. Print adhesion to the bed is really important and when printing with PLA, it’s pretty easy, as it sticks to most beds and if not, simply use some painter’s tape. ABS and other materials are more difficult and often require a heated print bed and/or special coverings. 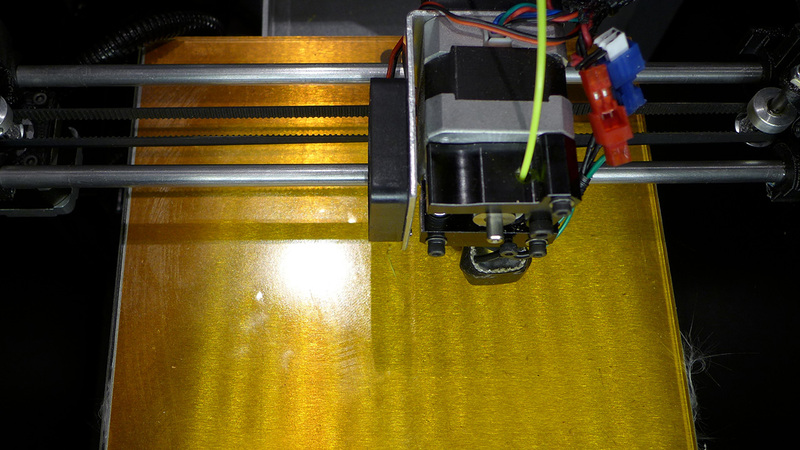 Kapton film is the go-to for heated print beds and can work well, if you do it right. I like the glossy surface finish that you get with Kapton, but it’s expensive and most sheets you get from print suppliers are 1 mil thick, which rips and gouges really easily. I look for 2 mil sheets, which are not only easier to apply, but hold up to a lot more abuse. Surface prep is really important, so use a squeegie (a credit card will do) to apply the Kapton without air bubbles and make sure to wipe it down with alcohol or acetone, when done, since oil from fingerprints can prevent prints from sticking. Some people apply an ABS slurry to the print bed to aid adhesion--it’s simply filament dissolved in acetone. My problem with with this method is if your slurry is, perhaps, blue and you’re printing in white, you’ll discolor the bottom of your print. 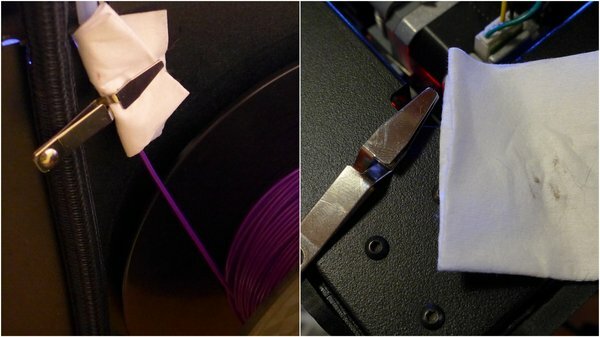 I prefer to wet the print bed with acetone, take a snip of my current filament and using a cotton cloth, rub it over the print bed. One final wipe with acetone will take off any big smears of plastic and evenly distribute a ‘sticky’ layer. 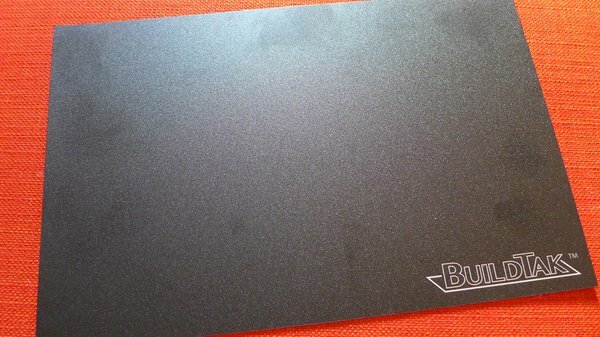 I have recently tried BuildTak which is a thick, textured plastic sheet that adheres to the print bed. It takes some getting used to, since you have to set your nozzle height a little higher than normal. Prints stuck to it like glue - sometimes too well and I found that if I let the print bed cool completely, prints were hard to remove but removal while the bed was still slightly warm was easier. If you have a print fail very early on, I would recommend letting the printer put down a few more layers before cancelling, as very thin prints were almost impossible to remove. As the BuildTak aged I noticed that I would get more and more white haze on the bottom of prints. I think that it was the surface of the BuildTak breaking down as it also started to gouge easier and chunks came out. Overall it worked very well and was far more economical than Kapton. Having tried a lot of different print surfaces, my next is probably glass, which many printers are using since it’s durable, flat, cheap and typically removable from the printer. Most of us don’t think about it, but rolls of 3D printer filament pick up fuzz, dirt and dust, which then feeds directly into your extruder. Makes sense to avoid that if possible, so I use a small modeling clamp and a cloth to clean the filament as it feeds. Living in an old NYC building, with three cats makes this a worthwhile tool. I’ve gone through a ton of tools for removing prints from the bed and my favorite is still a #96 painter’s palette knife. It has a slightly tapered, blunt tip that makes it easy to get under a print without damaging the bed or print. 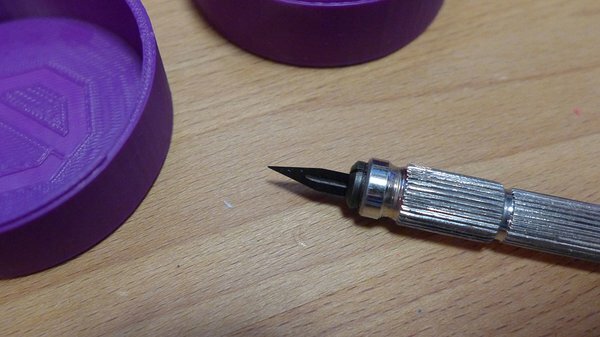 I will usually grind down the tip so it’s even thinner which makes it easier to get under the print, but be careful not to go too far or make it a sharp edge. 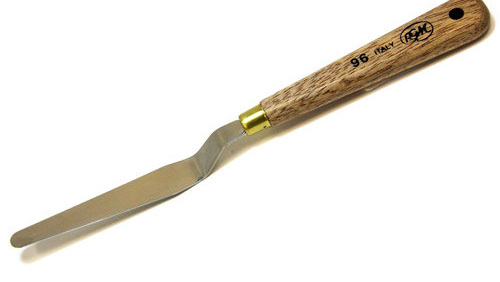 The offset handle makes it easier to keep the blade flat and get into awkward or tight areas. 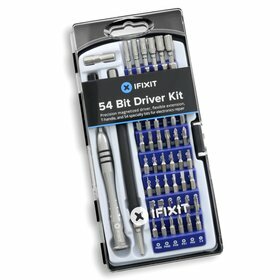 A great little tool kit that includes small Torx, JIS, Hex and more. You should be able to tackle most printer and electronics repairs with this versatile kit. Shim sets are color-coded sheets of plastic that have a specific thickness. I use these for setting the nozzle gap, rather than the ‘business-card’ method of sliding paper between the extruder and print bed. They hold up better than paper and different materials may require a different nozzle gap, so I just pick the right color shim. This is an extravagant purchase for 3D printing, but they are also useful for shimming and adjusting mechanical items - I use them for setting the focal depth on cameras. If you know someone who has a set, just cut some small pieces off for your printer - you probably want shims in the .004” - .010” range. Just a regular 1-2” wide paintbrush - good for removing debris from the print bed without getting fingerprints on it, which could cause print adhesion problems. For trimming supports and other defects I really like this modeling seam scraper, as it trims without cutting. Every time I try to use an x-acto for clean-up, I end up gouging the plastic, which this tool avoids. For really tough support removal I use Xuron Photo Etch Scissors. My other secret weapon, is the Magic Eraser, which I use on the bottom of prints that are often hazy and discolored - the Magic Eraser cleans them up nicely. Is there nothing it can not do!? Filament absorbs moisture which can cause bubbles to appear in your prints, so I keep mine in a storage bin with desiccants. I use these rechargeable cartridges which soak up moisture and can be refreshed in the oven (or microwave if you get the pricey plastic case). Keeping spools in the storage bin also cuts down on dust and dirt getting on the filament. That’s enough 3D printing for the year, let’s look at some other fun stuff! I’ve been perfecting my EDC and I finally have my ultimate kit. 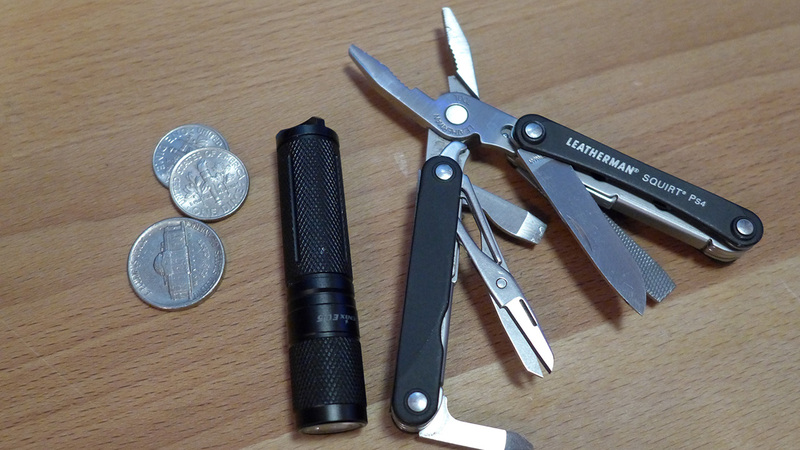 I need a multitool on me at all times, but I got tired of carrying my big Leatherman Wave, so I tried some pocket versions which were typically mini scissors and other stuff which I didn’t find very useful. I finally found the PS4 Squirt and have gone through three of them - it’s my standard issue. The mini pliers are great and a blade, scissors, screwdrivers, bottle opener and file make this a great little tool that fits in my watch pocket. I’ve also gone through a ton of flashlights, none of which I was happy with. Stumbled upon the Fenix E05--an AAA, super-bright, LED flashlight with three brightness settings and a machined aluminum body. It's perfect and fits in the watch pocket. My final addition will be a Fisher Space Bullet pen. After five long years of service, my MacBook Pro was getting long in the tooth and I needed a faster, lighter replacement. I was running bootcamp and couldn’t remember the last time I had actually used OSX, so decided to get a PC laptop, since most of my software was Windows. My requirements were a dedicated graphics card, lightweight and preferably a matte screen (hate the glossy). I ended up getting an Acer TravelMate TMP645 that fit all my requirements nicely. 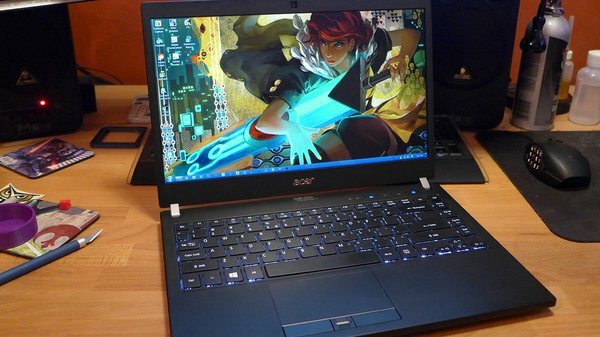 Never thought I would get an Acer, as I associate them with budget laptops and netbooks, but this has been a nice unit. Specs include an i7 1.8G Dual Core CPU, 8G RAM, 14” matte 1920 x1080 screen, 256G SSD, Radeon 8750M GPU, three USB 3 ports, HDMI, SD card reader, ethernet port (nice) and a carbon fiber body weighing in a hair above 3 lbs. Battery life is ok, not great at around 6-7 hours. 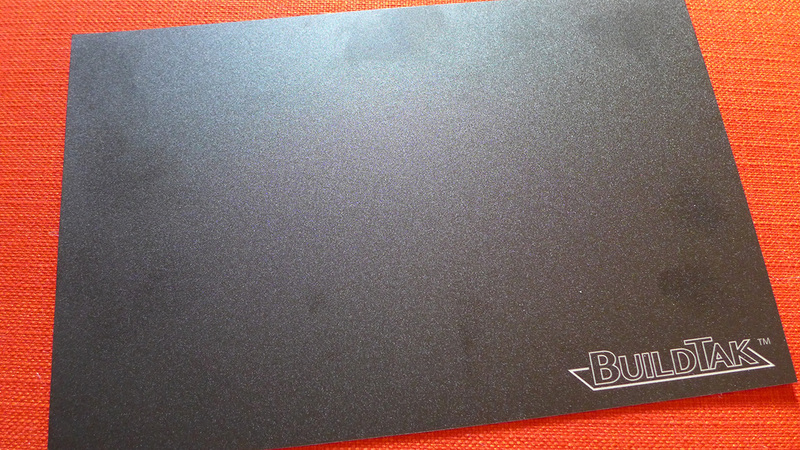 My only real gripe is the trackpad is substandard, especially after using a MacBook. It’s not the sexiest machine, but it has served me well so far. 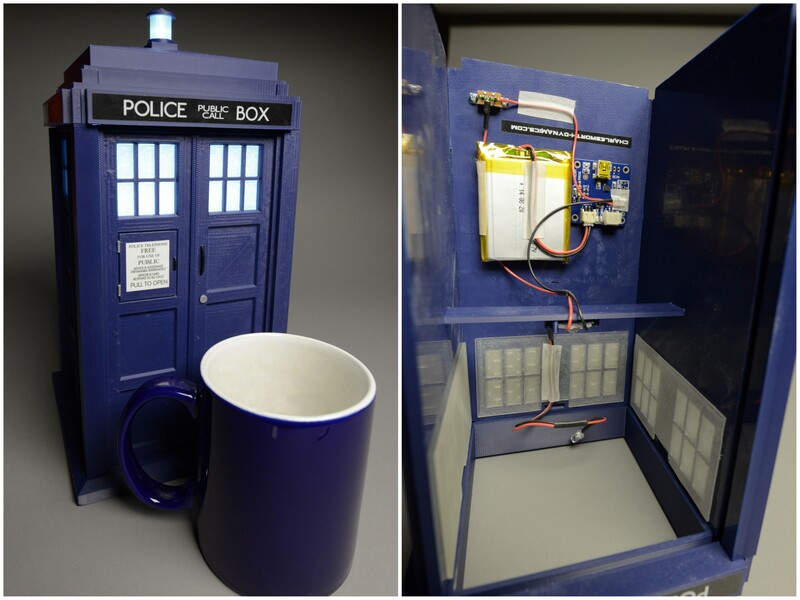 As you may have noticed, I’m a longtime fan of Adafruit Industries, here in New York and I have used them a lot this year for TARDIS kits, costumes, Motivators and many other projects. They always manage to have the exact thing I need and continue to introduce their own innovative products. For general parts, they curate ‘the good stuff’ so you can easily pick up quality LEDs, switches and other prime components. Their ‘Learn’ section and user forums are a treasure trove of information where novice and expert alike will find valuable information - I often get answers from support within an hour or two. 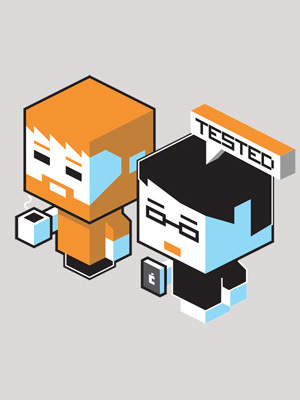 Their customer support is top-notch and shipping speeds are great, so if you need a microcontroller, lights, sound, or a TRON costume this is the place to go. Kris Kuksi’s book has been out for a while, but I finally picked it up this year. His creations are amazingly intricate sculptures, built mainly from found parts and model kits - think H.R. 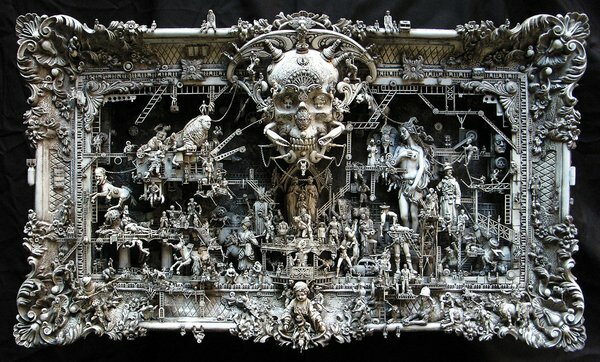 Giger as a kitbasher. I think the book is, unfortunately, out of print right now. 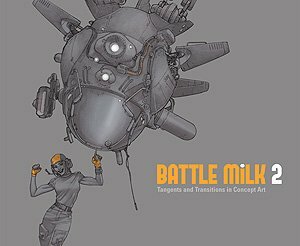 Another one that’s been out awhile, but I picked it up this year, Battle Milk 2 is the second volume of art from San Francisco based animation artists. Some great mechs, vehicles and spacecraft in here and even more in the third volume which I have yet to pick up. I have multiple copies of the Pocket Ref, which is a great, little book, with lots of stuff you need to know. Anything from physics equations, to welding guides, to tools, to electrical standards are in here. Worth every penny. I got some really good LEGO Ultimate Collector Series sets this year: the B-Wing, Sandcrawler, and the Tumbler. Norm and Will can attest to the coolness of the Sandcrawler, it was a fun build, tons of figures and a great display piece. It has tons of cool functions like the working cranes with multiple attachments, the moving treads and working steering, the front ramp lowers, the cockpit opens and lots of secret compartments - a great set. 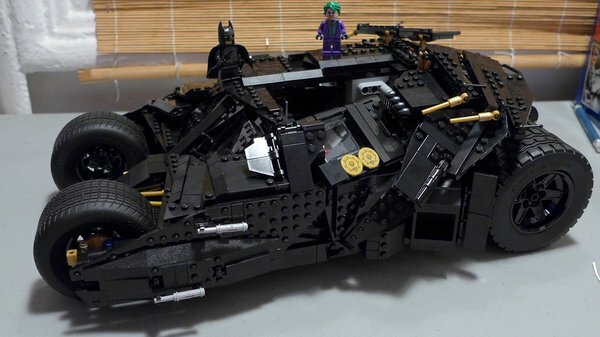 I’d have to say the Sandcrawler is my favorite, but the Tumbler looks great and is pretty movie accurate too. It has a finished interior with removable roof panels and LEGO even made custom tires for the set. I was a little bummed that there’s no steering function and they used fake shocks in the back instead of the functional Technic ones. I would also like to mod the front fenders to make them more movie-accurate, but overall it was a fun build and a great display piece. A good year for LEGO. I could go on and on, but these are just a standouts--looking forward to what cool and useful stuff next year will bring!